Well I started writing this post on saturday and somehow i could not finish it. 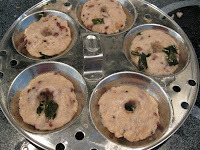 I actually wanted to write the recipe for nonbu adai last year itself Lol.... But couldn't do it. I donno why. 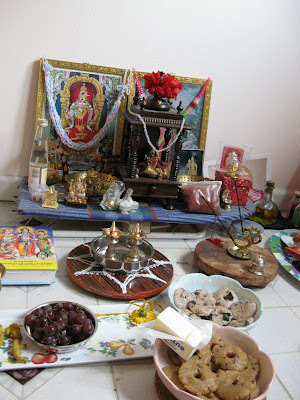 This is one of my favorite evening tiffin. Yep, my patti makes this as evening tiffin very often cos some in our family likes to eat the vella adai and some like to eat the uppu adai. So she makes both as a evening tiffin. 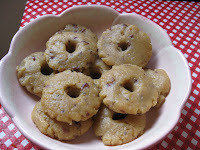 I follow my patti's recipe which is the default method everybody here follows to make adai. She usually dry roast rice, then wash it, let it dry and then again dry roast it and then grind it accordingly to make the adai dough. I usually follow that step. But this time, i didn't have time to do all those process cos i woke up late on saturday(!) and my manni told me that we have to tie the nonbu saradu between 12.30 PM and 1.30PM. Well i woke up around 10 AM and was not in a mood to follow that big process. So this time I followed my MIL's recipe. She also use the rice to make this adai. But she told me how to use rice flour to make this adai this time. 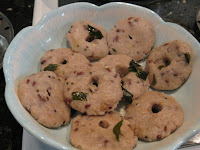 Here goes the recipe for both sweet and savory nonbu adai. Soak the black eyed beans in water over night and cook it when you are ready to start making the adais. 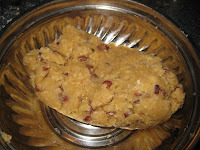 Soak the jaggery in 1 1/2 cups of water. In the mean time, dry roast the rice flour till it turns pink in color. Careful while roasting the flour. Do not burn the rice flour. Keep it aside. In the mean time, preheat a pan, add the dissolved jaggery water(by this time jaggery will be dissolved) and let it boil. 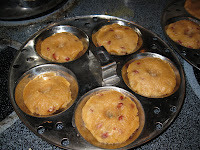 When it starts boiling, add the coconut, black eyed beans and flour and stir it continuously so that no lumps are formed. Turn off the stove and add the ghee and cardamom and cover the pan with a lid for five minutes. After 5 mts, open the lid and make sure the flour is fully cooked and knead the dough. If you feel, its dry, then sprinkle a little bit of water and knead the dough. Now make small balls out of it and make a small patties out of the balls, put a small hole in the middle and steam cook it until it becomes shiny. Just warm the rice flour in a hot dry pan. In the same pan, pre heat oil, splutter mustard seeds, add urad dhall and fry it till it becomes golden brown. Now add the red chillies, green chillies and ginger and fry for a minute. Add asafoetida powder and curry leaves. Now add the water, salt and coconut and let the water boil. When it starts boiling, add the cooked black eyed beans, rice flour and stir it continuously so no lumps are formed. turn off the stove and cover it with a lid. After 5 mts, knead the dough. As usual, if its dry sprinkle a little bit of water and knead it. Make small balls and make small patties and steam cook it until it becomes shiny. Nice clicks,,, looks perfect vidhya.. Your Nonbu adai I did only two-three weeks on Karadyan nonbu day. As you say from the begining I always use rice flour which I get in provision shop. I use to dry fry till the rice changes colour. This time both came out very well. 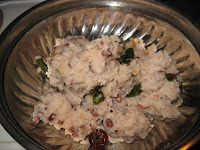 I feel happy that being in US your are following our festivals like nonbu Pongal deepavali etc. Keep it up. My wishes to you.